I suppose I should at least acknowledge this exists, even though I can’t say I have a huge amount to say about the actual content, and even though I have absolutely no intention of writing about it on a the regular. Whether or not it’s a bad thing is something that’s up to the individual, but this was very much another episode of Love Live, same sense of humour, snappy pacing and clever use of transition and all. The first season of Love Live Sunshine was certainly something I enjoyed, but did suffer something of an issue of deifying the original Love Live a little too much at times. It had something of a habit of aggressively referring back to things which occurred in Love Live, either explicitly or meta-textually, often to the detriment of it’s own characters and situations, which were generally strong enough to stand on their own. 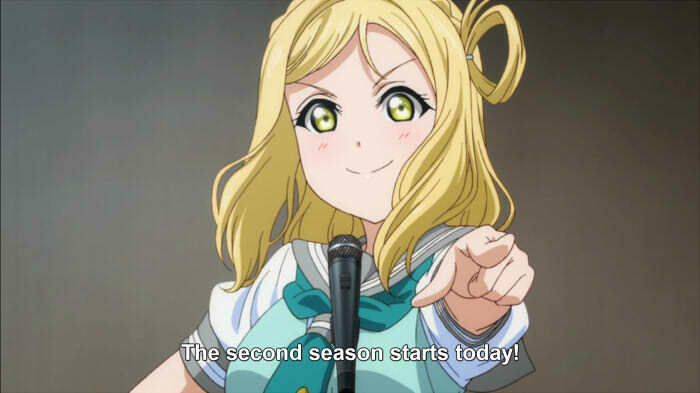 Whilst it had a habit of undermining events as they happened sometimes, It did serve a point in the end, admittedly – that is that, as long a shadow that μ’s cast over both the world of the show and in the real-life industry, actually recreating success by following the path that was followed in the original Love Live series is impossible. The series ended with Chika setting aside her admiration for μ’s in order to allow Aqours to forge their own path. In a lot of ways, to take the entirely reductive view, this first episode of the second series of Love Live Sunshine is instead something of a thematic inversion of the way the second series of OG Love Live started, presumably nowhere near by accident. In OG Love Live, even though they actually failed to even compete in the Love Live, they’d already actually completed their goal by this point in the series – they’d already saved their school from closure. What the episode then became about was Honoka resolving to have the motivation continue onwards in a situation where they had already grabbed victory. 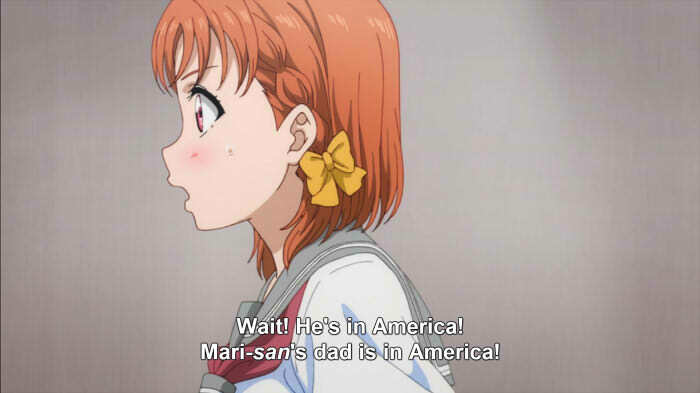 I daresent say, I’d imagine the real trouble Chika would have with meeting Mari’s father is that he’s a male in the Love Live universe over the age of five. Sunshine contrasts sharply with this, as we learn fairly early on that, whilst they have been successful in at least increasing interest amongst potential new students a little, the management have elected to move forward with the process of shuttering the school despite Mari’s protestations. Chika in this episode finds herself at a point of absolutely defeat, not victory, and instead it becomes about finding the motivation to continue despite that. This isn’t really all that interesting as a comparison beyond it, again, being something of an explicit statement of intent for the show beyond this point. Whilst it arguably makes an allusion to OG Love Live in how it’s making it, the statement being made here is that we are in very much new territory. Aqours miracle didn’t happen, so they have to make it themselves. Sunshine has to become entirely it’s own show. Which is, you know, a good thing, particularly given Sunshine handled it’s actual drama way better than Love Live tended to. 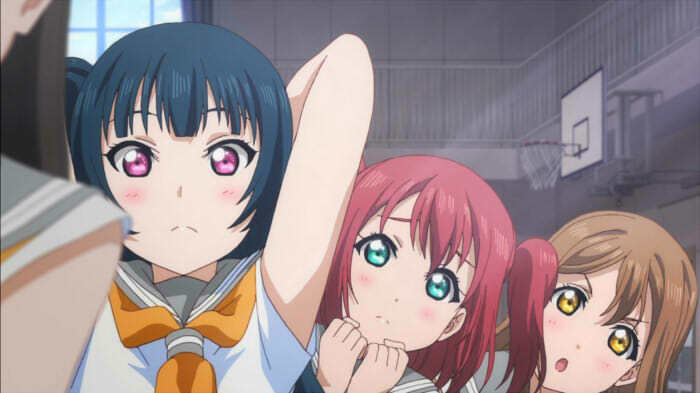 There’s not really a whole lot else I want to say about the episode, though – it was well-made and everything, but aside from some particularly gay Kanan and Mari scenes, and some of the usual indication that they’ve at least being paying some attention to what has been going on in the fandom in the intervening period, it mostly came across as a refresher on what the individual character gags and quirks are. Yoshiko acted all chu2, Hanamura proclaimed it was the future, and Mari talked in some goofy English. They didn’t have poor Riko terrorised by a dog, but they hit practically everything else. Got to save something for episode two, I guess. Also, I wonder what two colours the two colour pen had.